Congress is very unpopular. In November, according to the Gallup Poll, only 13% of Americans approved of the job that Congress was doing. That tied the record set in October for the lowest approval rating in the history of the Gallup Poll. Moreover, according to another recent Gallup Poll, only 20% of Americans believe that most members of Congress deserve to be reelected. That’s the lowest percentage in the 19 years that Gallup has been asking this question. These sorts of statistics, repeated in poll after poll, have given rise to speculation by some pundits and political observers that large numbers of incumbents in both parties may lose their seats next November as a result of the high level of public dissatisfaction with congressional Democrats and Republicans. Some analysts have even suggested that the anti-incumbent mood could produce an historic triple flip in the 2012 elections with control of both houses of Congress and the presidency all changing hands. If this happened there would be a Republican president along with a Democratic House and a Republican Senate in 2013. OK, time to get back to reality. There has never been a triple flip election and there is not going to be one in 2012. Not only that, but despite the abysmal approval ratings that Congress has been receiving, 2012 will not be an anti-incumbent election. That’s because opinions about the performance of Congress and opinions about whether most congressional incumbents deserve to be reelected have little or no influence on the outcomes of congressional elections. This distinction between Congress as an institution and its individual members is alive and well today. For example, in the same Gallup Poll that found that only 20% of Americans feel that most members of Congress deserve to be reelected, 53% of the respondents felt that their own representative deserved to be reelected. And this percentage would undoubtedly have been even higher if respondents had been asked about their own representative by name. When they vote in a House or Senate election, Americans cast their ballots based on their evaluation of their own representative or senator. As a result, the reelection rates for House and Senate incumbents are generally quite high, averaging over 95% for House incumbents and over 80% for Senate incumbents in recent years. Of course, there are occasionally elections in which a large number of incumbents lose their seats. In the 2010 midterm election, for example, 54 House incumbents and three Senate incumbents were defeated. It would be a mistake, however, to call 2010 an anti-incumbent election because 52 of the 54 defeated House incumbents and all three of the defeated Senate incumbents were Democrats. Only two Republican incumbents lost their seats in 2010 — both in strongly Democratic House districts. 2010 was an anti-Democratic election, not an anti-incumbent election. Research by political scientists has found that the outcomes of congressional elections can be predicted with a fairly high degree of accuracy based on several factors — the number of seats each party holds going into the election, support for the parties as measured by the generic ballot question, the popularity of the president and whether it is a presidential or midterm election year. When the president’s party holds a large number of seats going into an election; the opposition party holds a lead on the generic ballot; the president is unpopular; and it’s a midterm election year, the president’s party can expect to lose a large number of seats in Congress. That’s what happened in 2010 when Republicans gained 63 seats in the House of Representatives and six seats in the Senate. What happened in 2010 was fairly typical of what happens in a wave election — an election in which one party makes substantial gains in the House and Senate. 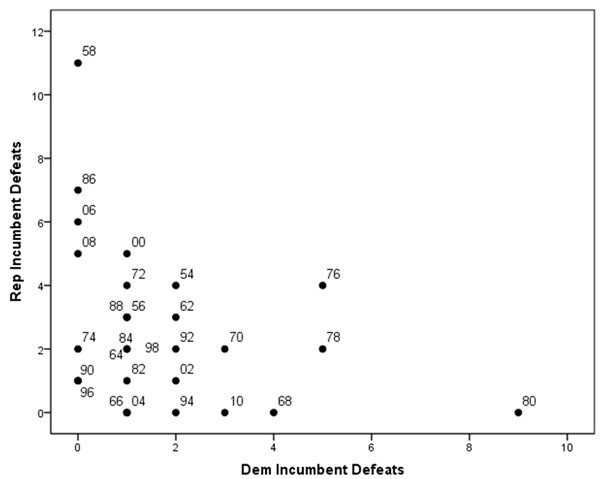 A large number of incumbents lose their seats but almost all of the defeated incumbents come from one party. The 2006 midterm was also a wave election, but the wave was going in the opposite direction. In that election 22 Republican House incumbents and six Republican Senate incumbents lost their seats but not one Democratic incumbent was defeated in either chamber. Source: Vital Statistics on American Politics and data compiled by author. Charts 1 and 2 display the relationship between Democratic incumbent defeats and Republican incumbent defeats in House and Senate elections between 1954 and 2010. The data in these graphs show that elections in which a large number of incumbents lost their seats were always wave elections in which almost all of the losing incumbents were from one party. There have been seven elections since 1954 in which at least 30 House incumbents were defeated: 1958, 1964, 1966, 1974, 1980, 1994 and 2010. Of the 279 House incumbents defeated in those seven elections, 263 or 94% were from the party that experienced a net seat loss in the election. Similarly, of the 32 Senate incumbents defeated in those seven elections, 31 or 97% were from the party that experienced a net seat loss in the election. There has never been a true anti-incumbent election in recent history — an election in which widespread public discontent with Congress resulted in a large number of incumbents of both parties being defeated. Of the 29 elections between 1954 and 2010, there was not one in which at least 10 House incumbents in both parties were defeated and only one, 1976, in which at least three Senate incumbents in both parties were defeated. 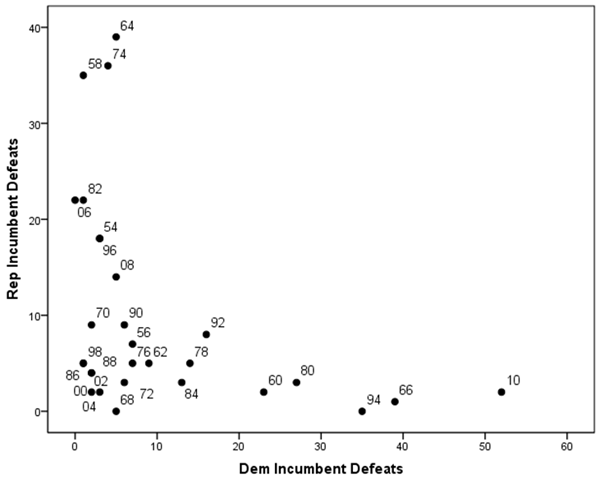 When one party suffers a large number of incumbent defeats, the opposing party typically loses very few incumbents. Thus, there were eight elections between 1954 and 2010 in which at least 10 Democratic House incumbents were defeated. In those eight elections, 219 Democratic incumbents lost their seats. In those same elections, however, only 24 Republican incumbents lost their seats. Similarly, there were eight elections between 1954 and 2010 in which at least 10 Republican House incumbents were defeated. In those eight elections, 204 Republican incumbents lost their seats. In those same elections, however, only 19 Democratic incumbents lost their seats. The record looks very similar for Senate elections. There were six elections between 1954 and 2010 in which at least three Democratic incumbents were defeated. In those six elections, 29 Democratic incumbents lost their seats. In those same elections, however, only eight Republican incumbents lost their seats. Similarly, there were 12 elections between 1954 and 2010 in which at least three Republican incumbents were defeated. In those 12 elections, 58 Republican incumbents lost their seats. In those same elections, however, only 14 Democratic incumbents lost their seats. Based on the historical record we can confidently predict that if a large number of incumbents lose their seats next November, it will be because 2012 is a wave election and that almost all of the defeated incumbents will come from the party on the losing side of the wave. It is still too early to predict what will happen in the 2012 congressional elections. Economic conditions could improve or deteriorate between now and next November or an international crisis could affect the president’s approval rating. And many states still haven’t finished drawing their new congressional district lines. The fact that this will be the first election after redistricting could put some House incumbents whose districts have been redrawn at risk. However, redistricting doesn’t always result in a large number of incumbent defeats in the next general election. In 2002, for example, only two Democratic incumbents and two Republican incumbents lost their seats in the general election. Some redistricting plans may be designed to protect incumbents of both parties. Moreover, some of the most vulnerable incumbents are likely to retire or be defeated in primary elections. One key predictor that is already known is the number of seats each party holds in the House and Senate going into the 2012 election. The fact that Republicans currently hold 242 House seats, the largest number that they have held in the past 60 years, suggests that Democrats are likely to make at least modest gains in 2012. On the other hand, the fact that 23 of the 33 Senate seats that are up for election in 2012 are currently held by Democrats almost guarantees that Republicans will pick up some seats in the upper chamber. We also know that 2012 is a presidential election year so Republicans will not have the advantage they enjoyed in 2010 of being the opposition party in a midterm election. Beyond these basic facts, it is likely that the results of the 2012 House and Senate elections will depend on the outcome of the presidential election. In recent years, there has been a very close connection between voting for presidential candidates and voting for House and Senate candidates. There is less ticket splitting and more party-line voting than at any time since the 1950s. So if either President Obama or the Republican nominee wins a decisive victory in the presidential election, the winning candidate’s party should benefit from a coattail effect in the House and Senate elections. A decisive Obama victory could help Democrats make substantial gains in the House and help them limit their losses in the Senate while a decisive Republican victory in the presidential election could help Republicans make substantial gains in the Senate and limit their losses in the House. Either of these scenarios could result in a wave election. On the other hand, a very close presidential election could increase the likelihood of a status quo congressional election with only modest Democratic gains in the House and only modest Republican gains in the Senate. Regardless of who wins the presidential election, though, it is highly unlikely that Democrats will make large enough gains in the House to regain control of that chamber and that Republicans will simultaneously make large enough gains in the Senate to regain control of that chamber. Either one of these scenarios is possible, but the chances of both occurring in the same election are minimal because Senate and House elections are both affected by the same national political forces. For the 32 elections between 1946 and 2010, there is a strong positive correlation between party seat swings in the House and Senate elections, emphasizing the close connection between the election results in each chamber of Congress. There has not been a single election in which a party gained at least 20 seats in the House while losing seats in the Senate. Moreover, since the adoption of the 17th Amendment to the Constitution, which provided for the direct popular election of senators, there has never been an election in which control of both chambers flipped in opposite directions. We can actually predict the seat swing in Senate elections quite accurately based on the number of Senate seats at stake for each party and the seat swing in the House. Even with the advantage of having only 10 of their own Senate seats at stake in 2012 vs. 23 Democratic seats, if Republicans lose 25 seats in the House, the minimum number required for Democrats to regain control of that chamber, the expected GOP seat gain in the Senate would be reduced to zero. The chances of a double flip election, let alone a triple flip election next year can best be described as slim to none . . . and slim just left town. If you want to see a triple flip in 2012, you should probably try to get tickets to the gymnastics competition at the London Olympics.